At the previous MS Devs meet up we deep dove into what has been added to version 2.1 release of .NET Core and ASP.NET Core and how to use it. This time we will explore more into .NET Core. With .NET Core being cross-platform, it allows us to leverage Linux containers and Docker to package up our apps. Now we can have the same code running on both our development machines as well as the production environment, without the need to worry about platform and framework differences. These containers can deploy easily to the cloud. 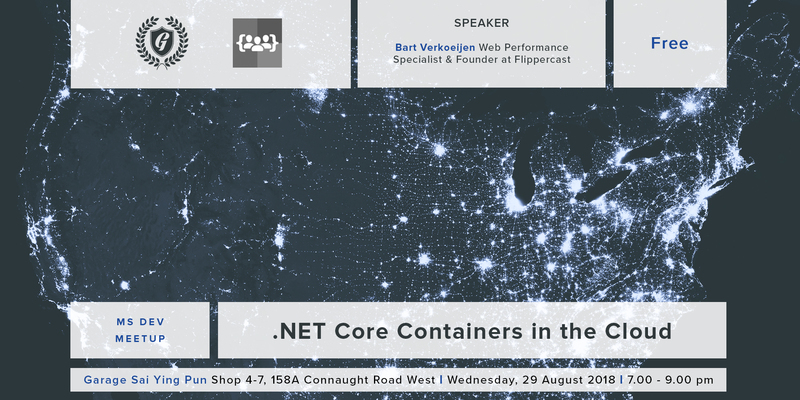 At this talk Bart Verkoeijen will discuss and explore with us what various options are available in Azure, including App Services, Kubernetes (AKS), and Container Instances. Bart Verkoeijen has been developing with ASP.NET Core since version 1.1. He's currently developing a web performance monitoring SaaS, and his backend will use ASP.NET Core. Previously he was frontend team lead at FinTech startup Quantifeed. He's Microsoft Azure MVP, and hosts several developer focused meetups in Hong Kong. Food & drinks kindly sponsored by Microsoft. Note: We have limited seats, therefore we would appreciate that you register and RSVP. Thanks!